It is suitable for any student of science as well as anyone wanting to enhance their knowledge. It is a real layman's guide to physics. It treats the reader as an intelligent person who doesn't happen to know about advanced physics; the phrase 'physics for dummies' is often mentioned but that sounds insulting to the reader. "What a great book! It is always helpful when someone can translate tricky science topics into plain English for non-technical folks." 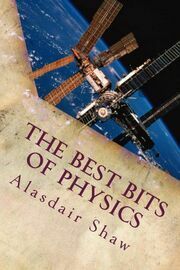 The complete review is available to read at https://readersfavorite.com/book-review/the-best-bits-of-physics. Physics made easy is one way of looking at it. Physics made interesting is another. You can order it from http://www.amazon.co.uk/gp/product/1484978293/ref=as_li_tl?ie=UTF8&camp=1634&creative=19450&creativeASIN=1484978293&linkCode=as2&tag=weblinks0a-21&linkId=GTWIAJWR4GYUNXFG. It is packed with A4 worksheets for you to photocopy. Some are comprehension passages and questions; others are experiment instruction sheets.